Do you follow Sugar Crafter's blog? If you don't, you should. Tracy has all kinds of great recipes, including a number of homemade jams and preserves. In fact, she has turned her love of canning into a business and sells her unique jams and preserves at local farmer's markets. That's pretty cool! I was browsing Tracy's blog recently and came across these stunning Brandied Apple Preserves. Apple pie filling anyone? Yes, please. When I read through her post, I found her delicious looking preserves were inspired by a new monthly canning project that kicks off this month called Can It Up, founded by Hima at All Four Burners. I'm totally in! I became enamored of canning after my first go at it. I've said it before, and I'll say it again...It's so completely satisfying to not only make your own homemade jam, but to preserve it to give as gifts or just always have on hand. I LOVE it. The first time I canned preserves I was nervous as heck. I downloaded the Ball guide to canning from the web and read it through about 10 times. It seemed like a lot of steps and a bit overwhelming. The hardest part that first time around was timing everything and juggling multiple pots on my stove top. But after one go round, it wasn't so intimidating anymore. 1. Clean jars and lids (don't re-use lids...jars and outer bands can be re-used, but buy new lids). 2. Heat jars and lids so the jars don't crack when you ladle in hot jam. 4. Fill jars leaving about 1/4 inch space at the top, wipe the tops clean with clean towel or paper towel, put on the lid and screw on the outer band. 5. Repeat step 4 until all jars are filled. 6. Place hot jars in a boiling water bath, fully submerged, and boil for the amount time indicated for the type of product you are canning. Most fruit jams/preserves take 10 minutes. 7. Remove processed jars from water bath and allow to cool on a kitchen towel on your counter for 24 hours, undisturbed. I don't own special canning equipment (no canning pot or rack, no wide mouthed funnel, no canning tongs, no magnetic lid lifter). I use my multi-pot to both heat the jars (step 2) and process the filled jars (step 6). In my early canning endeavors I used a separate pot for heating the jars and processing the jars, but then figured out it I could do it all in one pot. I use non stick kitchen tongs to lift the jars out of the hot water and then a doubled up kitchen towel to hold the hot jar while I use a small ladle to fill up the jar with hot jam. I use my tongs to grab a lid out of the hot water and gently place it on top of the jar and then screw on the outer band. Once all the jars are filled, I remove the strainer portion of my multi-pot and place the jars in the strainer (using a kitchen towel...since they are hot). I lower the strainer into the boiling water and process. It really is easy. October's Can It Up ingredient? Apples of course! Now the big question, what to make? 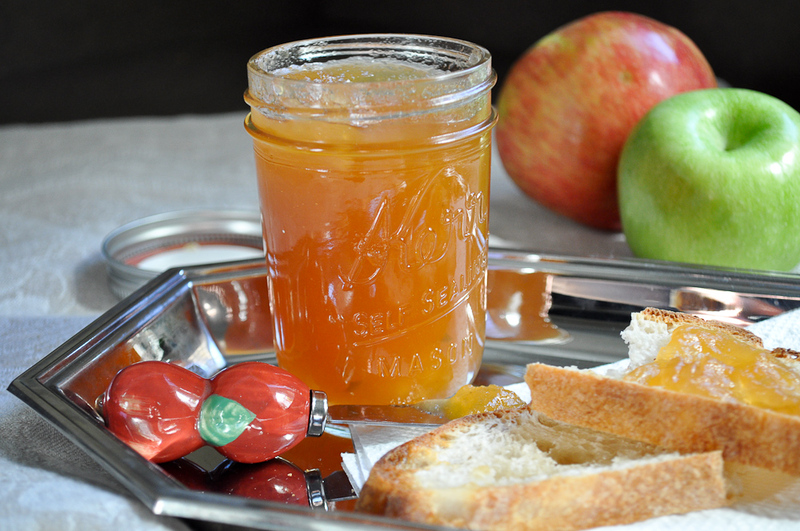 I made apple butter in my slow cooker last year so I wanted to do something different. I ran across a few recipes for caramel apple jam and I knew that's the direction I wanted to go. I saw several recipes that called for a mix of brown sugar and white sugar, reporting that the brown sugar added a caramel taste to the jam. These recipes also included spices, like cinnamon and nutmeg. I read some comments that said the caramel flavor was hard to detect and that technically caramel apples don't traditionally have spices in them. So I continued my search and found this recipe over at Hitchhiking to Heaven (another blogger with a love of canning!). What drew me in was the recipe called for actually making caramel and then adding in the apple. It had no spices, unless you count vanilla, and the recipe was pure caramel and apple. I'm pretty darn happy with the end product. The one comment/note I will change for next time is to let my caramel become a deeper golden caramel color before removing it from the heat. I was nervous the caramel would get too dark or burn so I removed it from the heat a touch early. I feel like the caramel flavor isn't quite as prevalent as I would like, though it's definitely there in the background. I don't miss the spices and even without them, this jam is reminiscent of apple pie goodness. A wonderful fall treat...to dress up your toast, use in a crumble bar or cookie filling or to give as a gift! I have 5 jars left to share with friends or family. So if you'd like to drop by and pick one up, it's all yours! If you want to get in on the apple canning action, you have until October 31st to link up over at Hima's site. I'm looking forward to seeing what November's ingredient will be. If you are making your own applesauce, start by peeling and coring apples and cut in to slices (about 1/4 - 1/2 inch). Place apples in a large sauce pan with water (about 1/2 cup) and bring to a simmer with the lid on for about 20 minutes, until apples are tender. Use an immersion blender (or a food mill) and puree the apples into applesauce. Prepare your jars and lids. Start by placing clean jars submerged in a pot of water, and bring to a near boil or until very hot. Heat clean lids in a small saucepan of water. Make the caramel. Take a large clean pot (at least 7 quarts) and evenly scatter 1 1/2 cups of sugar over the bottom of the pan (you want to add it evenly because you will not be stirring the mixture). Add 1/2 cup of water and lemon juice and bring to a slow boil, adjusting the heat as necessary. Do not stir. Keep a close eye on this as it turns from a clear syrup to caramel when you turn your back (the whole process took about 15-20 min for me). When the syrup turns a golden caramel color, remove the pan from the heat. While the sugar is caramelizing, combine remaining 1 1/2 cups of sugar and sea salt in a medium bowl, stirring to combine. If using a vanilla bean, split the bean lengthwise with a paring knife and scrape out the seeds. Place the seeds and the pod into the sugar mixture and set the sugar mixture aside. When the caramel is the color you want it, add in the applesauce, the sugar/salt/vanilla bean mixture (pod and all) and stir to combine over medium/low heat. Once the sugar is dissolved, bring the jam to a boil and stir continuously for 8-10 minutes, or until jam thickens. This jam sputters and splatters quite a bit, but the continuous stirring prevents it from getting too violent. Hot jam hurts! 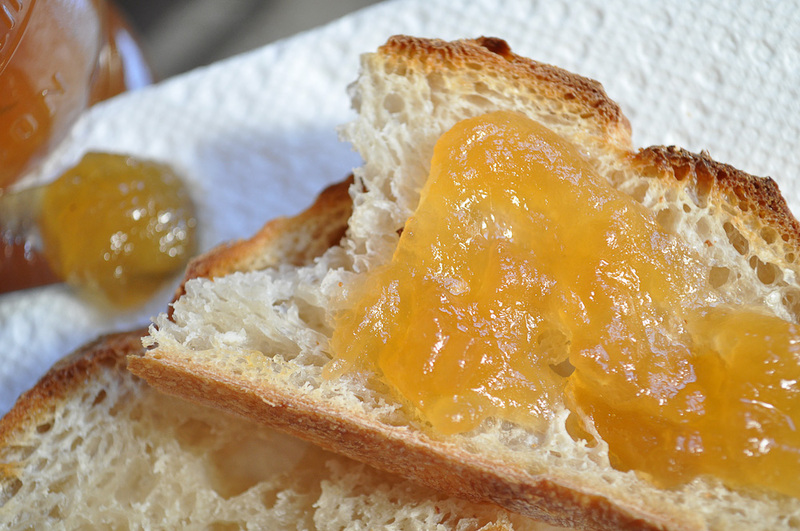 You can test jam by placing a small dollop on a plate and placing it in the freezer for a couple of minutes. If the jam easily slides off the plate when you tip on it's side, it's not quite ready. Once jam is done, turn off the heat and remove vanilla bean. Stir in rum. Remove a hot jar from your water bath (I use non stick tongs) and ladle jam into the jar, leaving 1/4 inch of head space at the top. Using a clean damp paper towel, wipe away any excess from the edge of the jar. Place a hot lid on top and screw on outer band. Process finished jars (completely submerged) in a boiling water bath for 10 minutes. Remove from bath and allow jars to cool undisturbed for 24 hours. Makes 6 half pint jars. I have canned for years--it is a very satisfying activity. I'm in the process of making Pepper Jam for Christmas gifts. I'll blog about it soon. Your jam looks so good! Thanks Cindy! Looking forward to seeing your pepper jam! Okay so, I have not done this yet and probably high time I should. I appreciate the breakdown (the 'gist') as it makes it much less intimidating and daunting of a project to make jam, preserves, goodness. I could never be mad if someone gifted me jam and fresh bread (my birthday is this month- just say'n. Love you. Thanks for the post Miss Gloria. Oh. my. word. This looks amazing! Thank you so much for sharing your recipe. Too funny you mentioned Sugarcrafter as I just started following her. I was just drooling over her Apple Cider Spice Bread! I so have to make that. And this, this for sugar (OK, that was supposed to be "this for sure" but the typo is so apt I have to keep it-haha.) Caramel apple jam? YESSS! Bring it on. WOW - this jam looks and sounds amazing! I adore making jam and this is perfect for fall. Pinning now!! This looks so tasty! Love it - what a unique flavor for jam! Can you double or triple this recipe or is it better made 1 batch at a time? I have only made one batch so I can't speak from experience. But I would think you could easily double it. The only caution I will offer is this jam sputters quite a bit so just make sure you have a deep enough pot so you don't get burned! How great to have an apple tree in your yard. I'm very jealous! I'm not sure if the sweetened condensed milk caramel method would work in the recipe. I would stick with the original recipe to be safe, especially if you are planning on canning it. Good luck! I tried the recipe, and made a few minor changes. I didn't pure the apples but mashed them into small chunks with a potato masher. I added spiced rum. The recipe calls for 3.5 cups of sugar in the ingredient list, yet the recipe itself for 3 cups (1.5 + 1.5). I erred on the side of less and used 3 cups. Yet, I found the final product too sweet. Maybe it was the apples. I used about 5 MacIntosh, 2 Granny Smiths and 2 Fujis. I'd make it again, but maybe with less sugar and more lemon juice. I made two batches of this today with Mexican vanilla extract instead of beans and golden rum. It's really beautiful and made of pure WIN! So easy. I was really skeptical about the caramelizing hands-off method, but was pleased to find that it worked perfectly. Thanks for sharing.